ANA Mileage Club used to be one of the best ways to book awards on Star Alliance partners such as United Airlines, Lufthansa, and Singapore Airlines. That changed after they completely updated the program. Now there are actually four different award charts depending on when, where, and who you fly. Fortunately that complexity also means there are many hidden values you can still take advantage of. This post covers some of the most popular examples and shows how the original distance-based awards that we all thought were gone continue to live on in the form of round-the-world awards. You’ll also see how seasonal pricing on ANA can work to your benefit without stopping you from visiting Japan for the famous sakura cherry blossom festivals. There are several important caveats to booking award travel with ANA Mileage Club. First, know that all awards are for round-trip travel only unless you are booking a trip wholly within Japan. Second, any companions must be registered with the program, and they must have a specific familial relation to the primary member. Finally, those who hope to book some of the most luxurious awards on partner Singapore Airlines will find their attempts thwarted: any award in this carrier’s first class cabin on an Airbus A380 or Boeing 777-300ER is blocked in the system. We avoid the issue by only using examples in economy or business class. ANA offers some excellent values to the rest of Asia during the low season, including Hong Kong (and the majority of China and surrounding areas) for just 80,000 miles in business class. This low season includes most of January, February and April when traveling from North America. 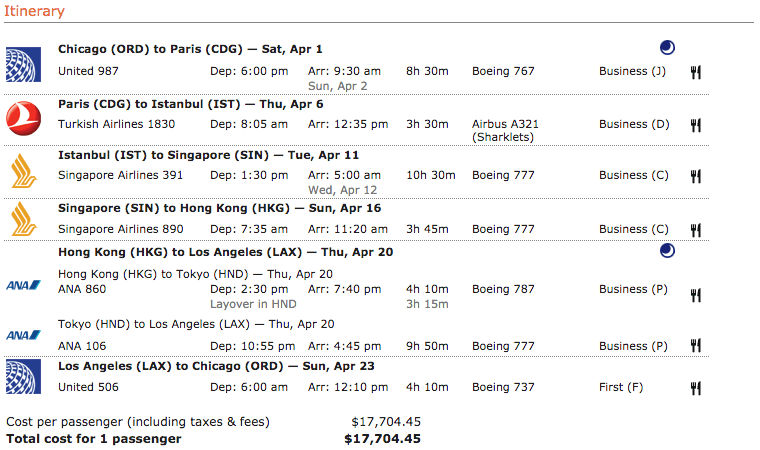 For example, an itinerary from Chicago to Hong Kong would normally cost $6,607. Yes, you’ll need to pay a carrier surcharge — an entire $4. Your triple shot latte might cost more. Regardless, expect to get close to 8.6 CPM for this award. Travel to Japan is even cheaper since no connection is required. Again, January, February and April are part of the low season (and you may be able to catch some of the last cherry blossoms in if you travel in early April) when you can fly for just 75,000 miles round trip. Regular season includes most of the remainder of the year except for key holiday weeks; these awards are 85,000 miles. Carrier surcharges are still just $4. Depending on when you travel you can expect to get 9.9 CPM during the low season — as in the example shown here — or closer to 8.7 CPM in the regular season. ANA’s specially discounted awards remain a good deal for other parts of the world but become less attractive as you venture further from Japan. India, Singapore, Thailand, and Vietnam are all 100,000 miles for a round trip business class award via Tokyo during the low season months of January, February, and April. In this example between San Francisco and Mumbai, expect to pay a carrier surcharge of $548, which is significantly more than the previous examples. However, it’s still a reasonable deal — after deducting the surcharge your miles will still provide almost 4.8 CPM. Although ANA Mileage Club offers some great discounted awards on its own airline, there are still reasons to fly a partner. For example, no carrier surcharges are collected when you fly with United Airlines or Air Canada Airlines. This $3,989 business class fare from Houston to Paris normally has a $856 surcharge — and it’s waived completely. You only need to pay a few remaining government taxes in addition to 88,000 miles for a round-trip award. Expect to get close to 4.5 CPM. 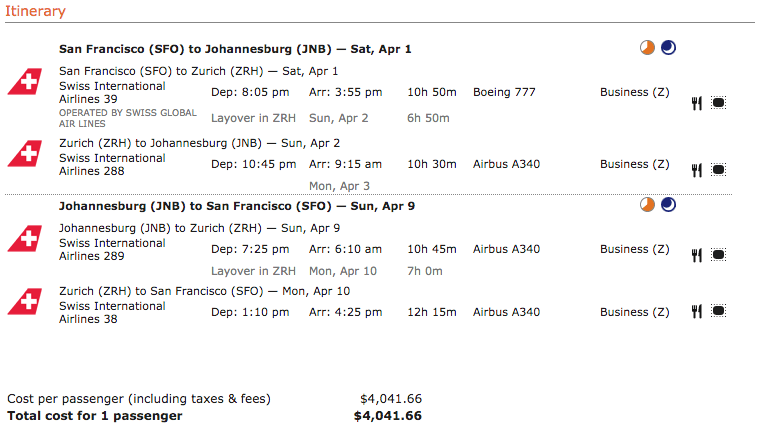 You will pay surcharges on this award from San Francisco to South Africa, but the award is otherwise fairly inexpensive at 104,000 miles round trip. Yet another example of how ANA continues to provide some good opportunities in its new award chart. Adjust the cost to include a $594 carrier surcharge and the miles you redeem are worth roughly 3.3 CPM. That distance-based award chart ANA used to offer? It still exists in the form of a round-the-world award chart. Rather than set a fixed cost for a round-the-world trip you can expect to pay a different price depending on the length of your total journey. Prices are actually identical to the old award chart — although who would book a 2,000-mile round-the-world ticket? A few rules do exist so that you don’t automatically book these awards in place of the new award chart: travel must always progress in one direction, either east or west, and you can’t return to your origin within 10 days. But giving these limits you may still find them attractive for some round-trip travel to far off destinations. Up to 8 stopovers are permitted. This example itinerary in business class includes only five stopovers (ITA has an upper limit on the number of flight segments) and travels a total distance of 21,556 miles. That puts it within the range of 20,001-22,000 miles traveled, so a business class award costs 125,000 miles and carrier surcharges are just $319. That represents a tremendous value of 14.2 CPM! Whenever you need to make an especially long journey — usually to Asia, India, or Africa — think about whether it makes sense to keep going and turn it into a round-the-world itinerary. ANA Mileage Club is probably the best airline loyalty program for booking these awards. It helps that they charge you only for the flights you take and not a flat amount, so you won’t feel pressured into taking unnecessary detours that don’t interest you. Getting back to basics, there are some niche awards within Africa that are a particularly good value with ANA Mileage Club. Perhaps you already used another airline to fly to Dubai. You can book an award in economy class from Dubai to Cape Town for just 30,000 miles round trip. After paying $144 in surcharges, redeeming miles is still a good value at 4.1 CPM. Let’s say you don’t want to fly economy. 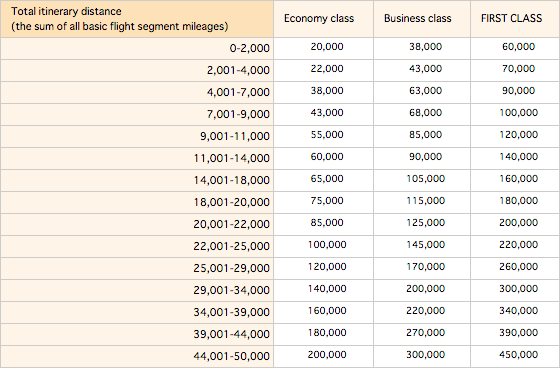 A business class award originating in Europe would only cost 68,000 miles. That’s still a surprising bargain even if the carrier surcharge is higher: $520. This sample itinerary on Lufthansa would return 5.1 CPM.